Four brave 12-year olds met with me for five three-hour sessions to think-up, plot, write and edit a book in a week. It was a blast with ideas flowing thick and fast and furious days of writing fuelled by Italian sodas. Day 1: We brainstormed all the things we wanted in our book: flying leopards, red and black bugs, jungle adventures, eyes floating the dark and chocolate. We then wrote character studies, setting studies and our backstory. Day 2: We plotted the entire book using Blake Snyder's "Save the Cat" Beat Sheet. I then wrote a chapter summary for every chapter. Days 3 and 4: We allocated the chapters and had to write a chapter an hour. Where necessary we all brainstormed the chapter to make sure that we were working in scene and to ensure we were evoking all the senses and emotions we needed. 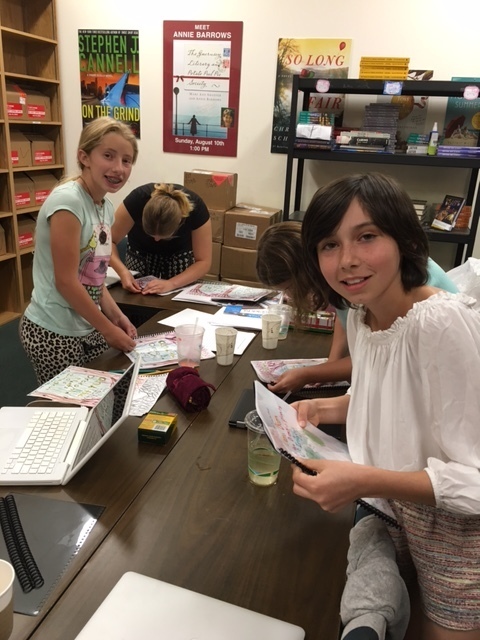 Day 5: We edited, revised, illustrated the front cover, printed and bound our novel, Leona Bloom and the Drexonia Plants of Imaginus. It was completed literally on the dot of 12pm on Friday ready for our presentation and reading in the Book Passage Event Room. I'm very proud of my fearless fellow authors, Kate, Megan, Petra and Pilar.